Amy here today, I am sure you are going to love her and her family's blog as much as I do!! Hi Amy! I am very happy to have you here today. First, introduce yourself and describe your blog. My name is Amy Eastman. My blog is Growing Up Disney and I write it along with my brother and father. I started it after returning from my oldest daughter’s first Walt Disney World trip for her first birthday. I found it difficult to find the answers to my questions relating to taking a very small child to Disney so I thought I’d share what I had learned. From there, I asked my brother to write to provide the single guy’s perspective. My father writes about DVC and Disney history since he’s been going since the very beginning. Just as our WDW vacations are filled with family and friends, so is the blog. Now I have a handful of friends who share articles related to all sorts of topics covering Walt Disney World, Disneyland Resort in California and Disneyland Paris. My brother and I had introduced my father to podcasts when he got his iphone. We started talking about maybe doing our own. After we returned from that trip, I began blogging since that was comfortable for me. I was already running a personal blog about my oldest daughter so it was simple to set up another one and hit the ground running. Thinking in terms of design what is the one thing you love most about your blog? I love our logo. One of my best friends designed the text logo and the image. The image began with a photo I took of “Tink’s” very first walk down Main Street USA. She was holding my father’s hand. It was a super sweet moment. 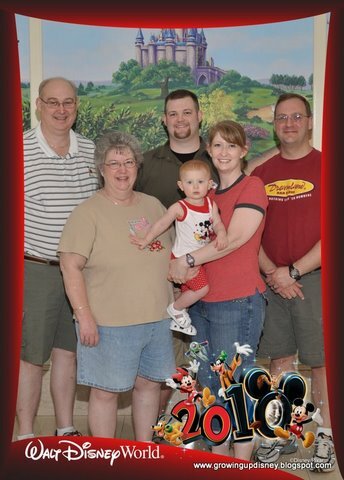 Once the blog began, that was the perfect image to capture the Disney wonder and family-aspect we try to share. Your live has been Disney-full, going often in your teen years, participating in the Disney College Program, getting married there, Tink’s first birthday, ect. How do you think literally Growing Up Disney has effected you as a blogger? My first trip to Walt Disney World was as a three year old and we’ve made regular visits ever since. As a blogger, I feel as comfortable writing about WDW as I would about my own real world hometown, or probably more so. As you mentioned, most of the major events in my life have either occurred at or been celebrated at WDW. What is the best piece of advice you have ever received pertaining to your blog? Keep it fun. A friend had started a wonderful Disney blog but found it to be too much work and quit. I’ve kept the philosophy that this always needs to be fun and if it’s not, we need to make some changes. I write out a schedule for myself and all the contributors but life happens and I try to be flexible. We’ve varied the publishing schedule as needed. Early on, we were posting 6 days a week. Now, I have a new baby as well as my preschooler and we’ve moved half-way across the country and are still getting settled into the new house. So now we publish new articles 3+ days a week. Having the contributions from my family and friends really helps keep us moving forward. How important is networking with other bloggers? Do you have any suggestions for connecting with fellow bloggers? Networking is vital. You must tap into the Disney online community for your blog to grow. For one, you can find some terrific mentors and friends. For another, you can find some wonderful folks who would be interested in reading what you’ve worked so hard to write. I think Twitter is the most effective way to connect with other bloggers. Like I said, we currently post at least 3 days a week. Early on, we posted 5 or 6 days a week and I think that was important. The additional posts helped us to figure out what worked and helped us to build a strong archive of articles. What is your favorite Disney event, and why? I love the Epcot International Food and Wine Festival. We try to go most years. I haven’t lived near my family since 2005 so it’s a nice time for us to get together at WDW each year. We’ve missed it a couple of times recently but new babies are the best reason ever to have to skip WDW. Back to the festival, I love trying new foods and the kiosks make that so easy. Do you have a Disney Vacation tip you would like to share with our readers? My biggest tip is to do your homework ahead of time; a Walt DIsney World vacation is too expensive to not prepare for. However, once you arrive, let the magic take over and try your best to relax. I’m not always very good at this part but I’m working on it. Thanks to Donna Kay for allowing me to be a part of her wonderful series. I’m so glad we have become friends and hope our paths cross at WDW someday. And WAR EAGLE!